One of the most important things you can do to provide yourself or your loved one with the most optimal chance at recovery is to spend time developing stress management techniques. Doing so can make the difference between being able to sustain your recovery and relapsing. For this reason, it is important that people in recovery develop stress management techniques and continue to practice them on a regular basis. By having stress management techniques in place, you will be better prepared for the challenges you may face in the future. Stress arises from a variety of different situations. Additionally, each person may experience stress in different ways from the next. A situation that might not be upsetting to one person could be highly stressful to another. No matter what the source, though, all types of accumulated stress may prove detrimental to health and well-being. It helps to identify high-risk situations that could lead to stress and/or relapse and be prepared to respond to these. Losing a job or starting a new job. Moving to a new area. Distressing events in the news. Issues at work or at home. Stress can take a toll on your body and your mind. Some people may ignore the signs of stress or confuse them with an illness, while others may feel a strong desire to use alcohol or drugs to deal with them. Insomnia or difficulty falling asleep. Who Answers? to get help locating an addiction treatment program in your area that offers relapse prevention and stress management techniques. Some people struggle when they first leave an addiction rehab and recovery center because they are thrust back into situations and social circles that they associate with substance abuse. Prior to treatment, some of these very situations may have led to stress and contributed to the use of drugs or alcohol as a coping mechanism. By cultivating activities that do not involve substance abuse, you will have an improved chance at avoiding such temptations and being able to manage the situations without turning to substance abuse. Exercise is an important way to relieve stress as well as cope with challenging situations. Consider developing a regular exercise routine that includes activities you enjoy. Some people like to play competitive sports, while others prefer going to gym, walking around the block or hiking. Group counseling or individual therapy can also be helpful for people who have difficulty handling stressful situations. By speaking with other people who are battling the same issues, you may be able to identify new coping techniques as well as experience less stress by simply talking about your problems. Getting enough sleep and eating a balanced and healthy diet can also help you manage stress. A good night’s sleep can leave you feeling rested and better able to handle stressful events that might occur during the day. Too much sugar or caffeine can add to your stress level. Some people find that yoga helps them relax and feel more energized. 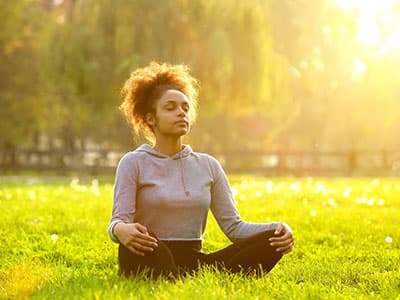 Other techniques, such as meditation, mindfulness and breathing exercises can help clear your head and help you focus on the present instead of worrying about the future. “Belly breathing.” Place one hand on your belly and one hand on your chest. Breathe deeply so that only the hand on your belly moves up and down. Do this slowly, in and out, making sure the exhales are at least as long as the inhales (or the exhales longer). This is called “diaphragmatic breathing” because it involves using your diaphragm, and it is associated with less stress and better health. Practice this for 5-10 minutes per day, perhaps in the morning or before bed. “4-7-8 breath.” Recommended by Andrew Weil, this is a powerful tool, when practiced regularly over time, to reduce anxiety and cope with cravings. Place your tongue on the roof of your mouth just behind your teeth. Exhale all of your air out and begin breathing through your nose. Breathe in for 4 seconds, hold your breath at the top for 7 seconds, and release air through pursed lips for 8 seconds. Do 4 cycles – no more. Practice this twice a day, do it consistently for 8 weeks, and notice how it affects your body and mind. Support systems can include family, friends, support groups and 12-step meetings. A strong support network can be a critical component of stress management and the prevention of relapse. Family and friends can be a great source of support. But stress-related issues that can lead to relapse may involve family situations and unhealthy family dynamics. By identifying those issues and working through them, you will have an improved chance at rejecting the temptation to manage your stress in the future by using again. Some therapists specialize in this type of therapy. Support systems can also include support groups and 12-step meetings such as Alcoholics Anonymous and Narcotics Anonymous. These programs offer peer-based support for people in recovery and can help prevent relapse. Former drug and alcohol users can share their experiences and help others in their recovery. No stress management technique will work for everyone. It may take some time to identify a stress management technique that is successful for you or your loved one. It should also be understood that stress management will not prevent stressful situations from happening. Stress is often a part of everyday life. There is not a guaranteed way to avoid it. It is possible to recover from a drug or alcohol addiction and maintain your recovery. By choosing a treatment facility experienced in treating addictions and teaching stress management skills, you can enjoy a brighter future. Contact us today at 1-888-319-2606 Who Answers? for help locating an alcohol or drug treatment center near you, including those that may incorporate yoga, exercise and other stress management techniques as a vital part of their recovery program.
. Sinha, R. (2008). Chronic Stress, Drug Use, and Vulnerability to Addiction. Annals of the New York Academy of Sciences 1141: 105-130.
. National Institute on Drug Abuse. Stress and Substance Abuse: A Special Report After the 9/11 Terrorist Attacks.
. Sinha, R. (2007). The Role of Stress in Addiction Relapse. Current Psychiatry Reports 9:388-395.